If you are planning to share copies of this Ebook with students in your classroom, please also purchase the NH117E Classroom License. Lessons explore the Puritans’ attempt to create a utopian community in New England. The first lesson considers the religious values, goals, and political beliefs which animated the Puritan experiment. The second lesson examines daily life and the way children were raised. 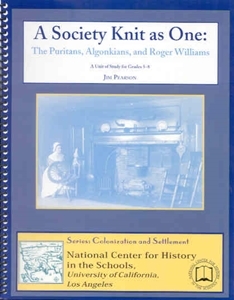 The third lesson studies the region’s original inhabitants, the Narragansetts, and their interactions with the Puritans. The final lesson introduces students to the Massachusetts Bay Colony’s local government, which offered important antecedents for representative government.